…and I’ve just run out of peppermint tea. Sad times. But I do have plenty of other teas, so I’ll survive. Also loving the postgrad tea room in my department, where else can you get hot drinks for 20p these days? Better than the 50p coffee from a machine that I was forced to make do with before! But enough about that. Loads of things have happened over the past few weeks, but I’ve not had time to post here. I tried picking up the same number of new anime series that I usually do, but didn’t have enough time for them either, so I dropped a load. And my complete series/giant backlog of unwatched stuff has hardly been touched. An MSc is a lot of work. Needless to say I can’t blog anime if I can’t watch it, I struggled badly enough when I had all the time in the world! So yep, this post is just a reminder that I’m alive, and a way to kill time while my usual haunt is down for maintenance. Will there ever be a time when this is regularly updated again? I predict the answer to be yes, mainly on the days leading up to my deadlines, while sitting in doors procrastinating, and trying to forget that things like wind and rain exist. I mean come on, why must people always try to turn everything to their advantage? Bad weather is annoying enough without people trying and failing to harness its natural, green energies, forcing me to have to write about it. All these advantages and disadvantages, most of which are subjective… Nuclear power is so much easier; it’ll either generate all the energy we could ever need, or wipe us off the face of the Earth. Win – win situation. Right? Right?? So I’m now back in Aberystwyth, a student once more. Still adjusting to the unfamiliar surroundings that are my new house and bedroom. This move was a week later than planned, thanks to the previous occupant leaving the in no fit state for inhabitation, but I’d only planned on lazing around and watching anime in that time since registration + lectures don’t start until later this week. Now I’m being forced up to campus at 9:30 AM for an induction session the day after arriving, and I expect to be increasingly busy from then onwards. And it seems that a delayed arrival wasn’t the only bad omen in store for me. I’ve already locked myself out once, forcing me to make my way to the landlady’s house barefoot and without my glasses (don’t ask). Thank goodness she lives just across the road. The fact that getting locked out supposedly happens to everyone doesn’t make me feel any less stupid, it just makes me empathize with the 100s of other idiots (mostly students I’d guess) who’ve probably made the same mistake today. I had hoped that would be the end of my bad luck, but less than an hour ago I made myself a cup of tea (peppermint – haven’t bought any milk yet)… and my brand new cup started leaking. Cracked right down the side. It’s very reminiscent of my first ever day as a student in Aber, four years ago, when I managed to break the handle clean off a new cup. I ended up keeping that one as a desktop pencil holder for the three years that followed, and that’s what I’ll be using the cup I broke earlier for as well. To top it all, I swear I was told by the landlady when I first visited the place that it had unlimited broadband. It isn’t, it has a 60 GB download limit. And since there’s 6 of us in the house, I’m can only use 10 GB of that or get into trouble with the other housemates when our connection gets slowed/stopped. Apparently the rest of the house uses some software to monitor their usage (and thus prove they’re not to blame if it happens), which I’ve requested they send to me too. As long as I’ve got that to keep count for me, I should be able to keep within my fair share. But it’s not all bad. My room as it is now is definitely inhabitable, I’ll remember to keep my key on me whenever I lock my door in future, I have a new pencil holder, the three housemates I’ve met all seem nice, and the former occupant’s laziness/forgetfulness means that, as well as all the junk he left lying around that’s now been dumped, he’s also left behind plenty of potentially salvageable food, and a cup to replace the one I broke. WIN. I don’t remember mentioning this in any previous blog posts, bizarrely enough, but in September I’ll be taking up a place in Aberystwyth University on their MSc Managing the Environment course. Since I barely scraped through my degree (got lazy in my second year, but proved I could do better in my third) there was limited funding available to me, hence why I’m doing it this coming academic year instead of the one that’s just finished – I couldn’t afford it first time around. But failing to find a job in this time has made saving difficult, so while I was confident I could attend this year and leave without a major debt, I’d have to live like a monk. Good for mind, body, soul, and probably exam results too, but not for my social life or manga collection! [EDIT] The second half of this post originally went on about a new voucher scheme which would have significantly decreased my tuition fees, but it seems my tutor was incorrect when he said I was eligible. 😦 Ah well, as I said I’m confident I can survive. I’ve a few old games, books and DVDs I could sell on ebay if desperate. All hail the Grand Shaman! Well the barbecue was awesome as expected, as were all the other things that happened during my almost-week at Aberystwyth. One of the highlights of it all was that I broke the ‘curse’ that seemed to afflict me during the three years I was actually a student there, by staying until the end of the barbecue. Well, technically I also did that in my first year, but was forced to separate from the group after we later went to a pub, and my underaged sister decided to down three (plus?) pints of Guiness… lame. But she wasn’t there this time. Neither was I excluded from the conversation, or struck down with food poisoning, so all was good! I didn’t take my camera, but I may post photos taken by others as and when I find them. Besides the barbecue, other things I did in Aber included going to Aberanime vice-president’s anime screening, which was fantastic (and since he’ll be president next year, and I’ll be a student again next year, this is a good sign); a few Pokemon battles, surprisingly I won three out of four; watched the live action film Onechanbara, which was so generic and predictable it wasn’t even funny; some nice walks around the seafront; a long game of D&D where we really didn’t accomplish much; but more than anything else we just sat down and chatted about random things. For example, what would be the best things to throw at an enemy castle? Starting off with lobbing bricks, via catapulting and trebucheting increasingly large items, we ended up with what was effectively an entire universe being propelled by rockets. I’m not sure what they were meant to have done to deserve all this, but they’d end up regretting it! 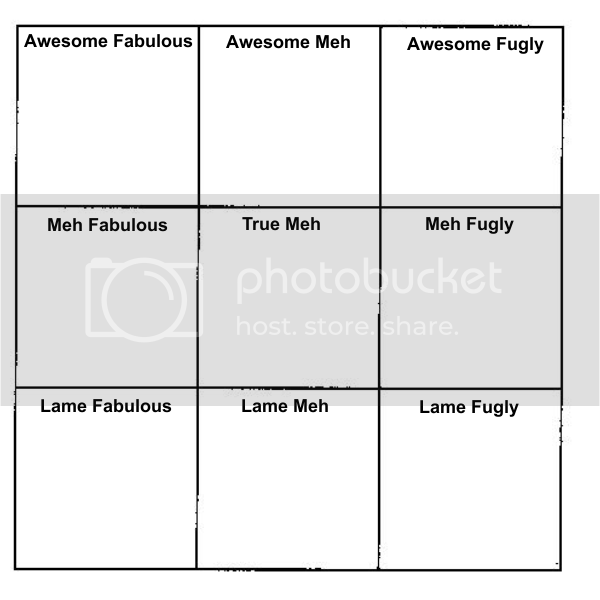 So during this discussion, we came up with our own alignments based on this system: Awesome – Lame and Fabulous – Fugly, with everything in between being Meh. We spent a long time fitting celebrities into these categories, debating with each other until we’d filled the grid with names nobody could dispute (so glad people agreed with me that Cheryl Cole = True Meh; I don’t dislike her, but think she’s hugely overrated). This was inevitably followed by us rating each other, and as the title suggests I was unanimously declared ‘Awesome Meh’. Which I think is pretty awesome. And a little meh. 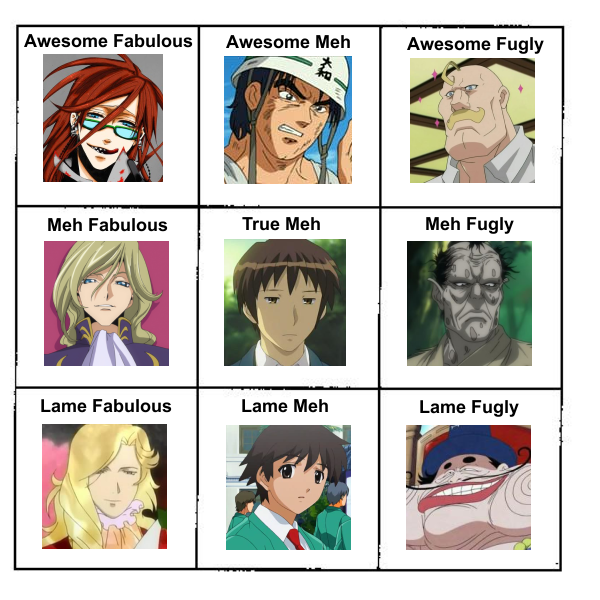 And now, exclusively to those people who read my blog, here’s one I made myself using anime characters. Aber, the expo and volunteering. Tuesday was my first day volunteering at Plas Tan y Bwlch. And I ended up going ‘bramble bashing’. Brambles have always annoyed me (except when they’re full of blackberries, then it’s all worth it), but I now hate them with a vengeance. They’re one of those annoying plants that have to be dug up at the roots, or else they’ll keep coming back to life, so I spent all day trying to get them out of the ground and onto the fire. A fire which I was just upwind of… smoky. This random piece of ash blew into my mouth, tasted disgusting, and all I could taste was smoke for the rest of the day. But anyway, I got better at it as the day went on, and I think I successfully bashed ~75% of the ones I encountered. The area I covered was pretty small, but you’d struggle to find any brambles left there (above ground, at least). So I’m quite pleased with myself, considering I thought I’d be rubbish at it. Physical exhaustion aside, I’m surprised at how well I adapted mentally. I’ve spent the last 6 months watching anime or otherwise entertaining myself, all day every day. And all of a sudden I’m outside in the cold bashing brambles. And I just got on with it. I wouldn’t call it fun – there’s plenty of brambles around our house and I’ve not felt the urge to declare war on them – but it wasn’t boring either. 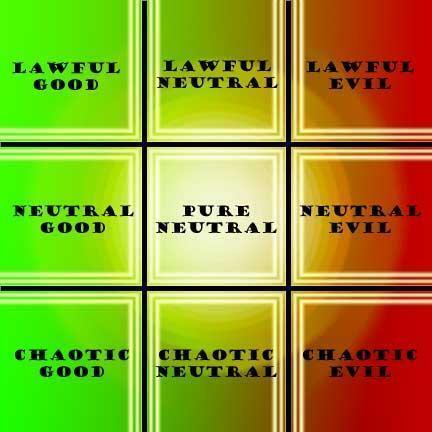 So assuming I can keep that mindset going, I should have less problems adapting to the real world than I feared. And so I’ll be going back there tomorrow for more! Suddenly, I have things to do! …which doesn’t happen on the following morning. Aside from getting an early night, no plans for Friday at all. Then at some unearthly hour on Saturday morning, we’ll head off to catch the train to… Shrewsbury, where we have to get off and catch a bus due to rail maintenance. But this bus will take us to Telford, home of the Midlands MCM Expo! Where I’ll buy moderate amounts of manga + anime, and no figurines. Because I’m meant to be saving for university. 😦 Meh, even the travel + entry costs are more than I’d usually spend on a weekend out. But it’s the one time since leaving uni that I’ve treated myself, so I’ll spend just enough to maintain balance between my stingy money-hoarding side and my obsessive-otaku side. My next post will likely be on Sunday or Monday; with a long weekend like this ahead of me, I should have plenty to talk about when I return. Like all my (very few, very small) purchases.